A Farm-to-Table Menu You Can Make at Home - What's for Dinner? Dig into some of our favorite farm-to-table recipes, stocked with the freshest meats and produce you can find at a farmers' market near you. A drizzle of balsamic, plus a heap of chopped hard-boiled eggs, turns tender asparagus enrobed in temptingly salty prosciutto into a worthy side dish. Celebrate sweet winter squash and warm spices in this velvety-smooth soup topped with New York Bakery’s® Seasoned Croutons and toasted pumpkin seeds. Topped with raspberry dressing and crunchy walnut, sweet grilled peaches offer a roasted flavor with herbaceous greens and the salty-mildly sweet combination of prosciutto, red onions and creamy mozzarella. Enjoy a hearty meal of juicy ham and Provolone cheese layered on champagne dressing-infused collard greens. 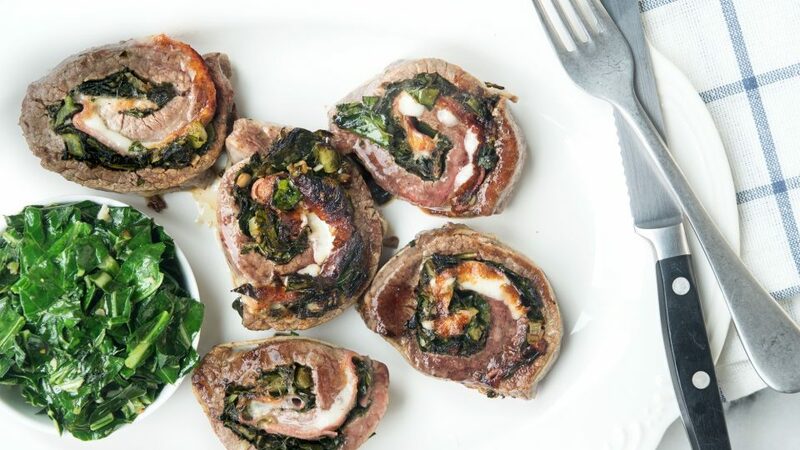 A fitting filling for tender flank steak rolls! 47% of homecooks would also make this recipe! Turn humble sweet potatoes into a hearty meal with rice pilaf stuffing and Girard’s® Raspberry Dressing. 58% of homecooks would also make this recipe!